RDSI communicates between the receiver and the drive using a RS-485 serial interface. Using a Flex M receiver you can control up to two drives per serial communication card. Just add another module to the receiver to add additional drive pairs. RDSI’s modular design enables plug-and-play compatibility with the Flex M receiver. Use the same receiver component for every size of application—no switching necessary. 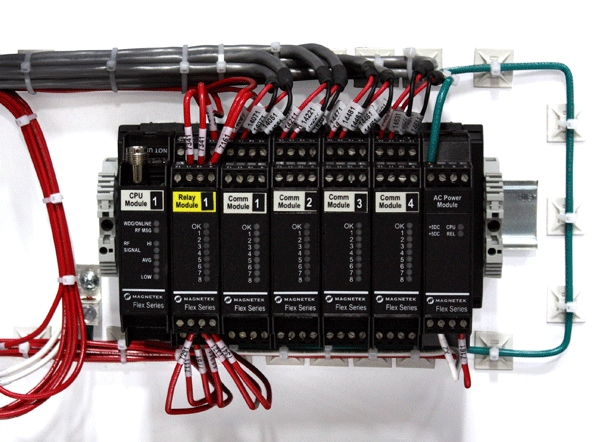 RDSI automatically detects drive types; allowing you to communicate with all of your drives using only 4 wires; and eliminates the need for relay cards, excessive wiring and labor costs. RDSI displays feedback parameters directly from the drive, allowing you to access diagnostic and troubleshooting information on the ground. We’ll build your system to your specifications – chose a transmitter, receiver and drive to build a completely customized system.